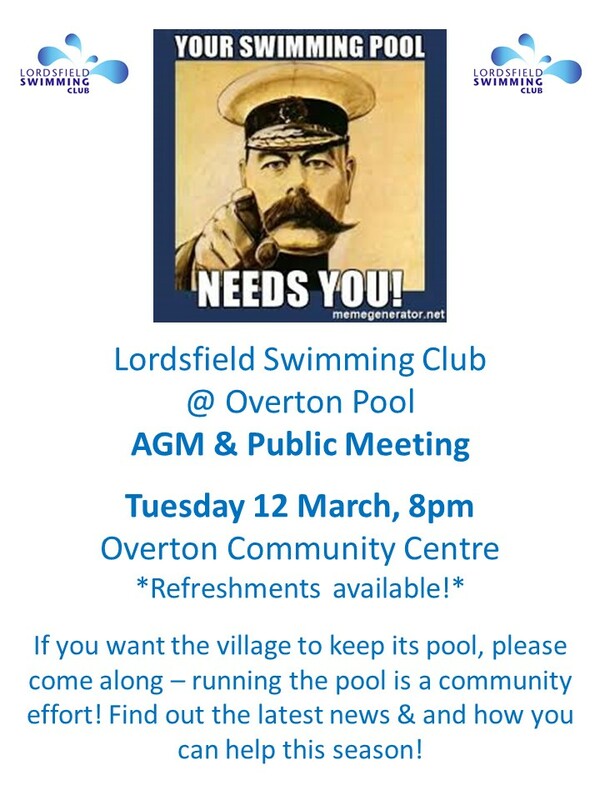 Please look out for the latest pool news & updates on Facebook (LIKE the Lordsfield Swimming Club page) and in the monthly village News & Views newsletter. Lordsfield Swimming Club has been providing Overton youngsters with the opportunity to enjoy the water since the 1960s, and has taught generations of children to swim. Staffed solely by volunteers, it’s a community facility run by and for the village community. The 23m outdoor heated pool is operational annually from the end of May until the end of August, and is open to young people 0-16 years resident or at an educational setting in the village. Lessons and swimming challenges are also offered, as is weekly adult swimming (Saturdays, 4-5pm) and lane swimming (Tuesdays, 5-6pm). It’s a fabulous facility and is extremely popular! LSC Information leaflet 2017 - everything you need to know!